Home > Blog > When I Buy a Business, Should I Have a Non-Compete Agreement? Buying or selling a business is a detail-intensive ordeal. One of the most crucial parts of the final sales agreement is the non-compete agreement. A non-compete agreement is a contract where the seller agrees not to compete directly with the buyer within mutually agreed-upon parameters. Clearly, any potential buyer is obligated by common sense to have this agreement set in stone before completing a big transaction. If no non-compete agreement is in place, nothing prevents the seller from setting up shop next door with the same product right after the sale is finalized! Here we will address what factors the courts consider when determining whether a non-compete agreement is enforceable or not. Beware. Having an invalid non-compete agreement can cost more than the simple absence of one. 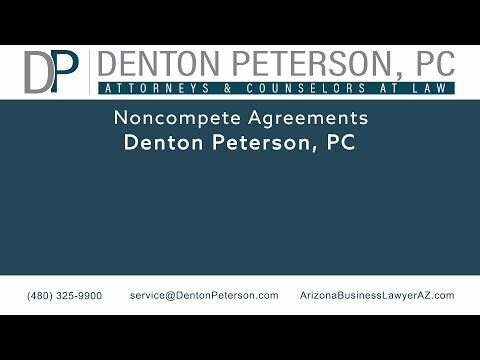 The first thing a court looks at when deciding a non-compete agreement is valid is whether the limitations on the seller are “reasonable.” Under Arizona law, a court will place heaviest emphasis on whether the restrictions are “reasonable” in two categories, geographical area and time period. Frequently, a seller is forbidden to compete within a certain radius of the sold business by the non-compete agreement. For example, a non-compete agreement can mandate that the seller not sell the same product or service within 100 miles of Phoenix, or within an entire state, or multiple states. It is up to the court to decide whether these restrictions are reasonable if the agreement is challenged. What a judge deems “reasonable” depends on many factors. If a company that conducts almost no business outside Maricopa county would have a hard time convincing a judge that their competitor cannot do business in Albuquerque. On the other hand, it is possible that the company plans to expand to Albuquerque the following year, in which case the restriction may be found to be reasonable. It is a good idea to outline which areas might be prohibited, and list reasons why the buyer has any reason to forbid the seller to operate there. This can help the court determine what is and isn’t reasonable. The next serious consideration the judge must take into account is how long the seller is forbidden from competing. Most non-compete agreements prohibit the seller from engaging in business competition in a set geographical area (see above) for a distinct time period, like two years, five years, etc. Just as in geographic restrictions, the judge will determine whether the time period restrictions are reasonable by investigating each party’s business type and interests. As you can imagine, this “blue-pencil” throws a lot of instability and unpredictability into the mix of non-compete agreements. As such, there is a way to avoid a total loss of the agreement if a judge decides it is unenforceable, and put the control back in the hands of the signers of the contract. This method is called a step-down provision. A step-down provision is a carefully worded section that sets a primary restriction which, if “blue-penciled”, provides alternatives for the court to select from. For instance, there is a non-compete that prohibits the seller from competing for seven years. If the judge deems this unreasonable, instead of just deeming the entire agreement unenforceable, there is a back-up, or step-down provision that restricts the seller from competing for four years instead of not at all. 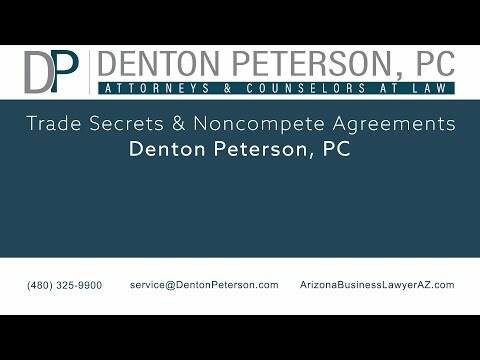 Noncompete Agreements | Denton Peterson, P.C. 5. Have a reasonable geographic scope. Step-down provisions are a fairly new practice, and their future is still somewhat up in the air. A crucial determinant of whether an agreement is enforceable or not is whether each part had the capability to negotiate the terms of the non-compete. A large chunk of the non-compete agreements cases are built in to employment contracts, where new employees sign stating they will not compete with their employer. In this case, a brand-new employee has almost no bargaining power to alter or decide the terms of the non-compete agreement. In addition, these contracts frequently endeavor to forbid an employee for working for a competitor. Though non-compete agreements like these have frequently been found unenforceable, this article is talking about non-compete agreements when selling a business, not about contracts for employees. When selling a business, all parties have much more similar negotiating positions, and as such are more able to influence the terms of the agreement. Due to the fact that both parties have influence in the contract, a new business owner need not fear that a well thought out and professionally done non-compete agreement will be unenforceable if challenged. Making sure that a non-compete agreement is enforceable should be a top priority. Employing a professional Phoenix business lawyer to assist you in writing your non-compete agreement will have the best results with the least chance of being struck down by a judge. It is absolutely essential to have an Arizona business attorney look over a non-compete agreement before signing to protect you from the possibility of the contract being found unenforceable, and your business damaged.